Since AMD has had a few leaks about their Tahiti GPU it only serves to reason that nVidia would manage a few of their own. After all, what is good for one side is good for the other. We found these while clicking around (as usual) looking for something interesting out there to write about. We happened upon a German 3D site called 3DCenter and found a very interesting news post to write about indeed. The article appears to have information about nVidia’s upcoming Kepler GPUs (as well as some info about a Fermi Refresh). nVidia is changing things up a bit here with the launch of Kepler (again if the information in the article is correct) instead of pushing their high-end GK100 out the door they are launching the mid-range to low end GK104. 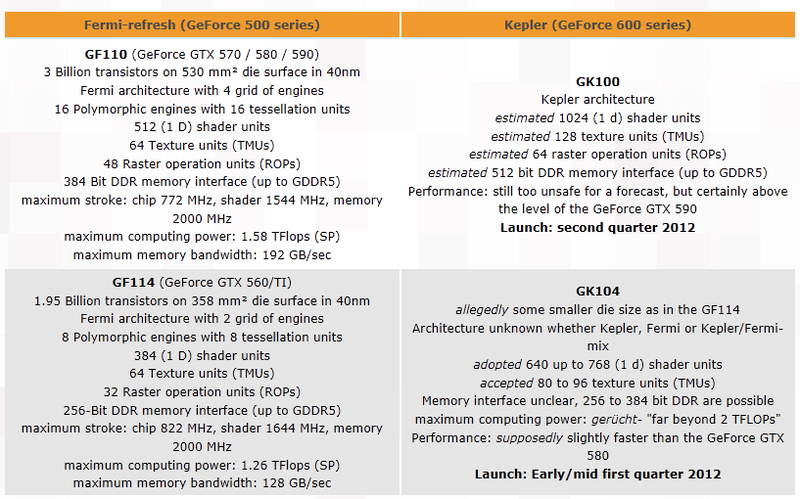 This has led to speculation that the GK104 might not be a full Kepler based GPU (although we think it probably is), but might be some type of hybrid between Kepler and Fermi. The opposite side of this argument is that if nVidia wanted to capitalize on sales and get the most out of each wafer they might opt to push production of the smaller and less complex GPUs while building up a good stock of the higher end GK100. After all when Fermi launched we saw shortages of the GPU right out of the gate due to issues with TSMC’s 40nm process. We have also heard that TSMC’s 28nm process while doing better than 40nm has some issues all on its own. While this does not impact AMD too much due to their GPU design it does hurt nVidia and their large monolithic die. Although we are not certain this is what is happening it would seem logical that nVidia would want to improve their ROI on this generation of GPU which could be the reason for the shift in release dates. We will hit up nVidia for more information to see if we are close to the mark on this one (and if the specs are real).